‘Jonny Boston’s Hot Jazz’ on tour at Farnborough Jazz Club, Kent, UK. 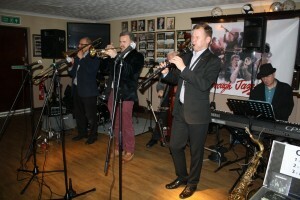 (LtoR) Dave Hewitt (trombone), Gary Wood (trumpet), Jonny Boston (reeds), Tim Huskisson (piano) (out of view: Martin Guy (drums) & Trefor ‘Fingers’ Williams (d.bass)). 4th March 2016. Photo by Mike Witt. 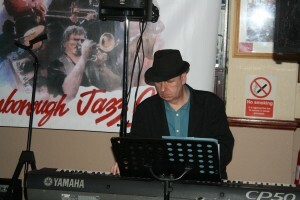 We first met Jonny years ago, when he played with Phil Mason’s New Orleans All Stars. They played for us at Badger’s Mount Hotel and then here at Farnborough (when the club house was razed to the ground). Phil discovered Jonny whilst he was busking in London’s underground. 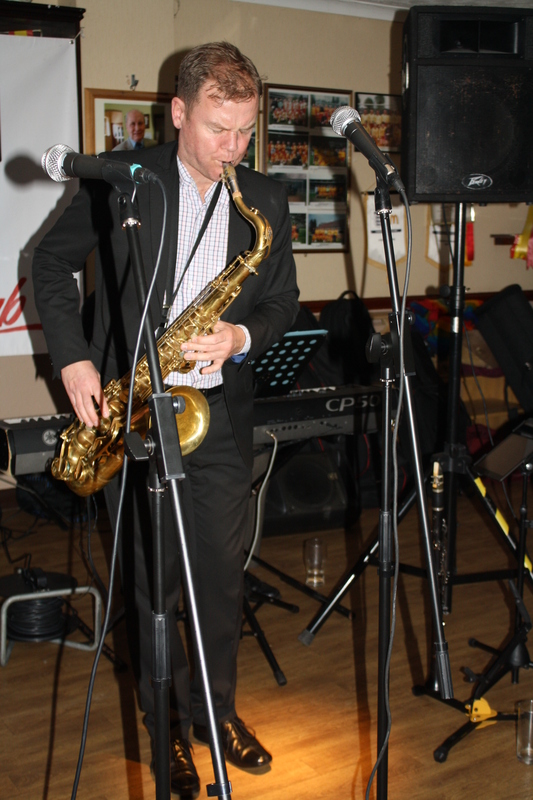 Since then, Jonny has played with so many greats, such as Max Collie, John Dankworth, Georgie Fame, Jamie Cullum and Eddie Izzard. See video below as a guest with The Pasadena Roof Orchestra. He was also with The Philharmonic Orchestra, Barry Martyn & the Young Bloods, TJ Johnson’s Bourbon Kick and oh so many others. Awarded Yorkshire’s TV Young Player of the Year, Chris Barber, who was a judge, invited Jonny & his ‘Boston Tea Party Band’ to play with his own ‘Jazz & Blues Band’? As for 4th March, It WAS, as I predicted, a humdinger (sorry I seem to love that expression) of an evening – a show and a half, to say the least. Each and every one of these musicians are brilliant in their own right and together, they were nothing short of dynamic. Here, I could swear, because I cannot decide what tunes NOT TO INCLUDE!! They were all wonderful. We’ve had some pretty amazing evenings over the years, but this evening was certainly amongst one of the best. They started off with a hot rendering of ‘JellyRoll’ Morton’s jazz composition, ‘Wolverine Blues’ which set the tone of a great evening of Dixieland jazz. (‘JellyRoll’ is said to have published the very first jazz composition). Their next number ‘Higher Ground’ was sung by Jonny. By the way, he has a marvelous voice and has published a beautiful gospel CD, well worth a listen (although this one is not included, he plays the tunes with great jazz hand-clapping warmth – see below for details). 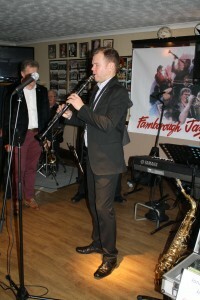 Jonny Boston plays clarinet on tour with ‘Jonny Boston’s Hot Jazz’ at Farnborough Jazz Club, Kent, UK on 4th March 2016 (Gary Wood &Martin Guy on left). Photo by Mike Witt. Jonny played clarinet beautifully to ‘At the Jazz Band Ball’, (Kenny Ball & Ted Heath both recorded) which enticed our visiting dancers (Jane and Alan) onto the floor. Alan said to me midway through the evening, that he had read my write-up and thought I was probably exaggerating, but said I definitely wasn’t – ha). ‘Stairway to the Stars’ was probably my most favourite number of the evening (if I really had to choose). Tim played a beautiful intro and Jonny sung it with such feeling. I had remarked in my notes ‘gorgeous’, with ‘lovely trumpet’ and ‘fab sax’. Tim Huskisson plays piano with ‘Jonny Boston’s Hot Jazz’ band on tour at Farnborough Jazz Club, Kent, UK 4th March 2016. Photo by Mike Witt. 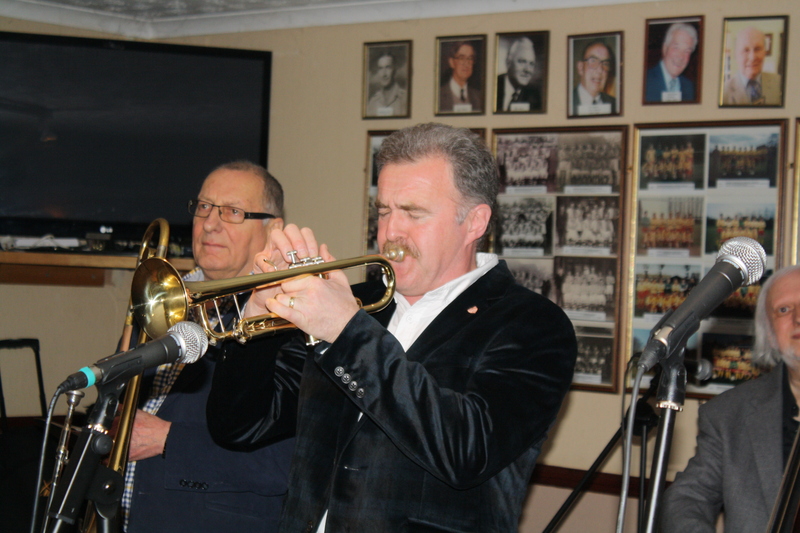 Gary Wood on trumpet (Dave Hewitt (tromb) to his left & Trefor ‘Fingers’ to his right) with ‘Jonny Boston’s Hot Jazz’ on tour here at Farnborough Jazz Club, Kent, UK 4th March 2016. Photo by Mike Witt. Next, a ‘King’ Oliver number (recorded by Louis Armstrong), ‘Dippermouth Blues’, with Gary singing this time. 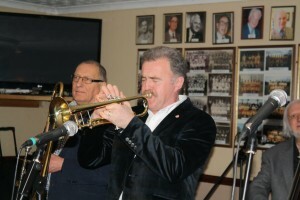 He used a muted trumpet, oh and of course, we (the audience) did ‘our bit with calling out in the right place “Oh play that thing”. We had a go at our line dance (not too many of us this week, but still lots of fun for us) to ‘Panama’. 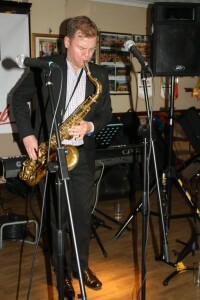 Although we should have done so to ‘Dancing Cheek to Cheek’, sung by Jonny. 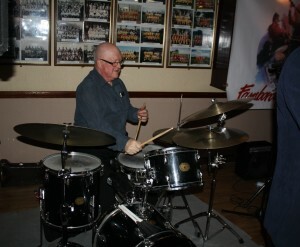 ‘It Don’t Mean a Thing If It Aint Got That Swing’ was sung by Gary, with some fabulous drumming from Martin. Following on, Jonny sung ‘Deep River’. It was a tune sung in many films, including ‘Show Boat’. 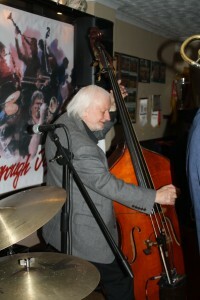 Trefor ‘Fingers’ excelled on double bass, with some lovely trumpet sounds from Gary too. I’m still fighting choosing what not to write about, but must mention Dave’s fabulous trombone tones with ‘T’Aint What You Do, It’s the Way that You Do It’ and then ‘Sweet Georgia Brown’ with Jonny on clarinet. 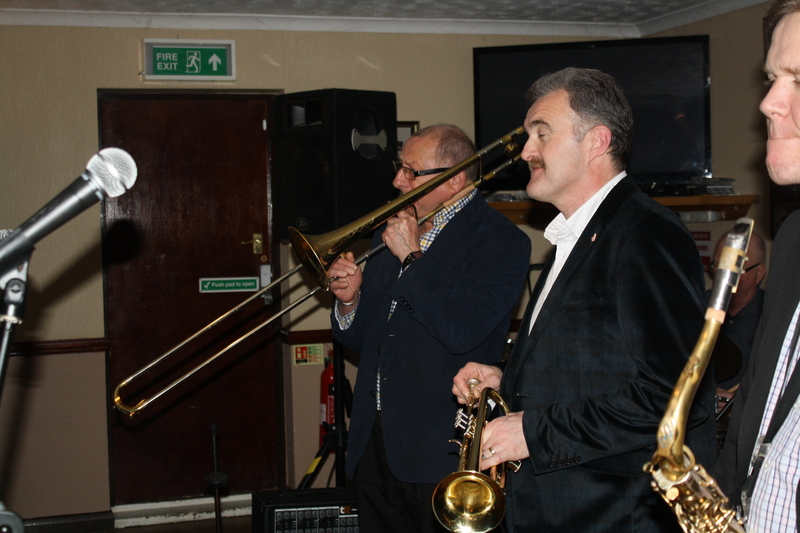 ‘Jonny Boston’s Hot Jazz’ front line (LtoR Dave Hewitt plays trombone, with Gary Wood (trumpet) & Jonny Boston (sax)) on tour at Farnborough Jazz Club, Kent, UK 4th March 2016. Photo by Mike Witt. 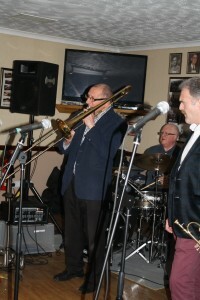 Dave Hewitt on trombone (Martin Guy (drums) & Gary Wood (trumpet) on left) with ‘Jonny Boston’s Hot Jazz’ on tour here at Farnborough Jazz Club, 4th March 2016. Photo by Mike Witt. Their last tune that sent us all off into the night with a warm glow, was a genuine foot-stomping, hand clapping gospel tune made famous by ‘Acker’ Bilk, ‘Let The Light (from the Lighthouse) Shine on Me’. Hopefully this evening will all be repeated again soon! Sorry guys to have told about almost your whole evening – I still left off some brilliant numbers, but I haven’t spoilt the rest of your tour as we were your last gig. Oh and by the way Jonny, I think Phil must be bursting with pride with his protégé from way up high. 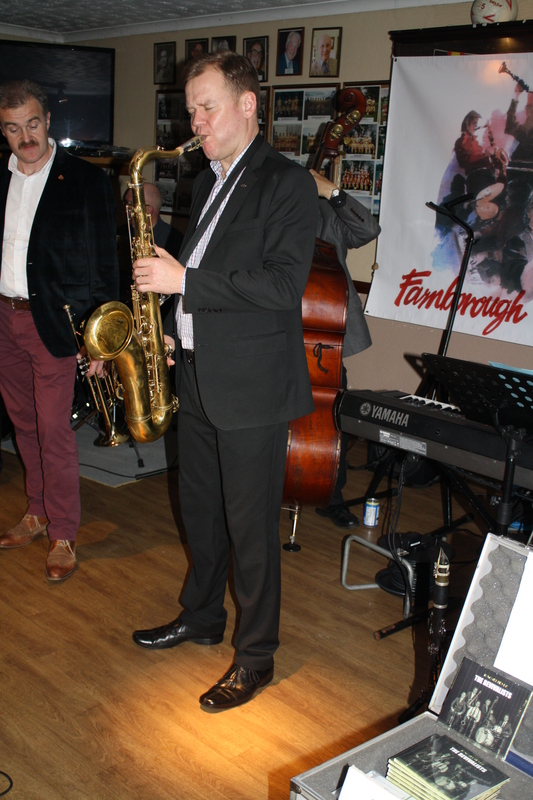 Jonny Boston plays tenor sax ( d.bassist Trefor ‘Finger’ Williams just behind) with ‘Jonny Boston’s Hot Jazz’ on tour at Farnborough Jazz Club, Kent, UK 4th March 2016. Photo by Mike Witt. Jonny Boston plays tenor sax with his ‘Jonny Boston’s Hot Jazz’ on tour at Farnborough Jazz Club, Kent, UK 4th March 2016. Photo by Mike Witt. 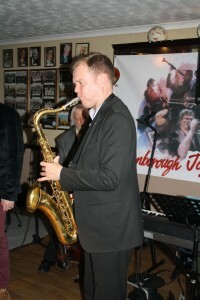 Jonny Boston plays tenor sax with his ‘Jonny Boston’s Hot Jazz’ on tour at Farnborough Jazz Club, Kent, UK. 4th March 2016. Photo By Mike Witt. P.S. 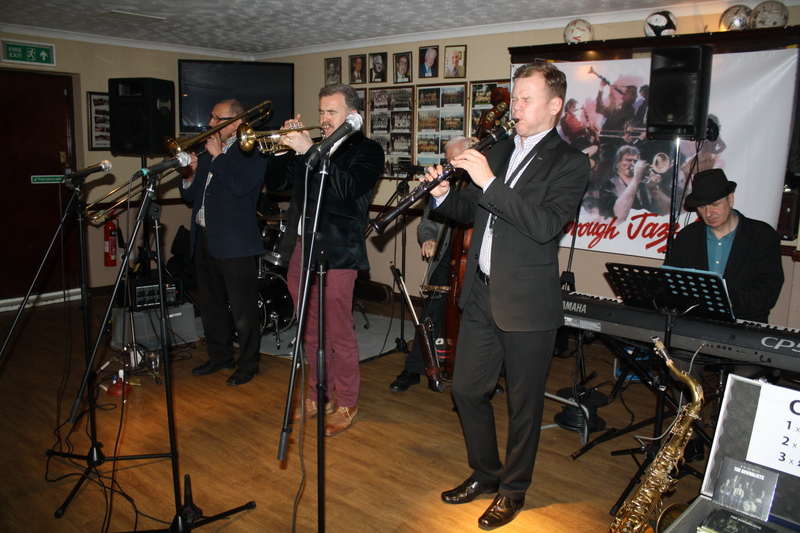 I told you last week, the tour also included Sylvie’s Place on 2nd and Sidcup Jazz Club on 3rd March, but hadn’t realised they played during the afternoon at the ‘Spice of Life’ and then onto us in the evening, what stars they are. You lucky people. ‘At The Jazz Band Ball’ – (m) Nick LaRocca, Larry Shields (1917), (l) added 1950 by Johnny Mercer. 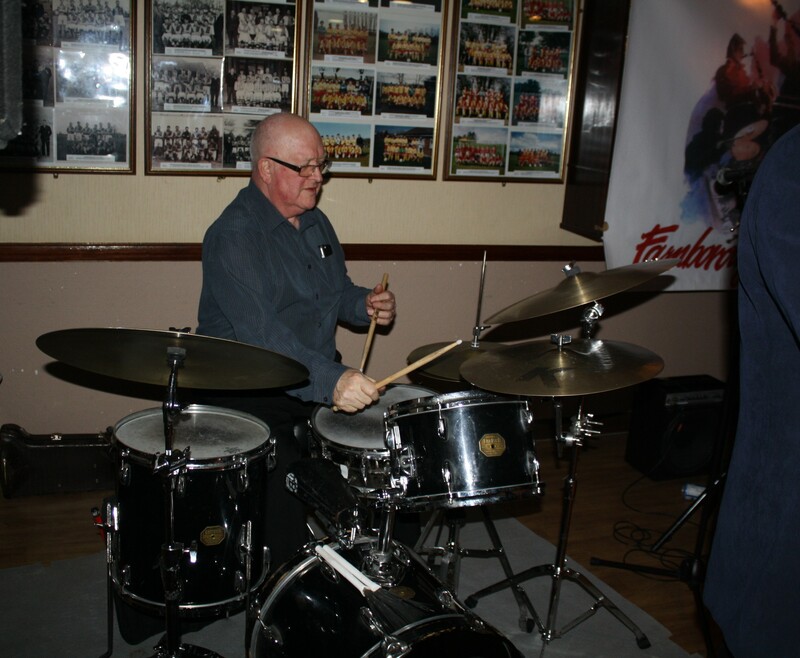 This entry was posted in Jonny Boston's Hot Jazz on March 6, 2016 by Diane.